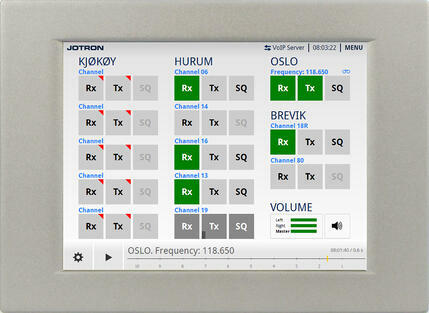 The RRC 7700 is the latest generation of VoIP based remote radio control from Jotron. The unit will operate the components in the Jotron TR77xx family of basestations. RRC 7700 is a standard Windows application, and runs on a set of desktop computers with touchscreen. These computers are selected for the highest stability and operational lifetime possible. RRC 7700 makes no difference between using a single Tx or a group transmission: Select the channels you want to transmit on – press the PTT button and talk. The message is streamed to the radios and transmitted on air. Listening to an incoming message is equally simple – just select the transceivers you want to listen to, and the audio is sent to the loudspeakers when the receiver detects an incoming transmission. The squelch of the individual receivers may be forced to open (e.g when receiving a very weak signal or just for test purposes).